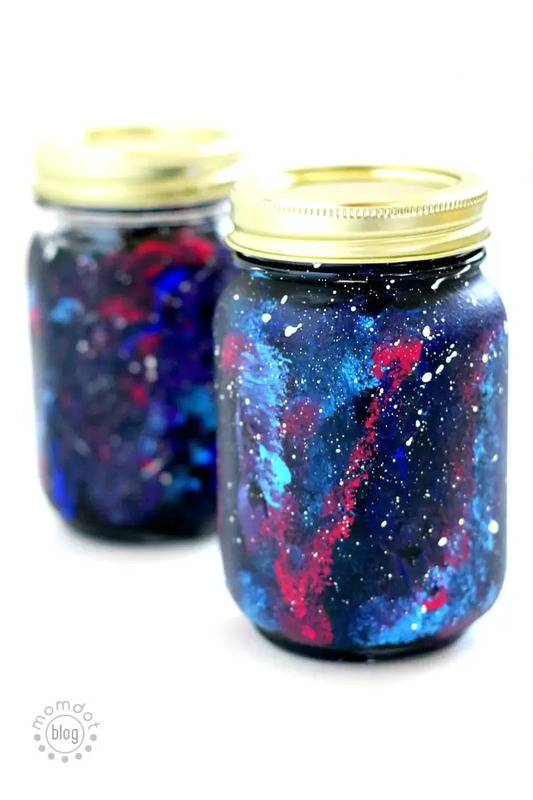 As you know, I love creating “galaxy” and earth related crafts and recipes around here. It’s just so fun to swirl colors around to create something beautiful that is tasty too. 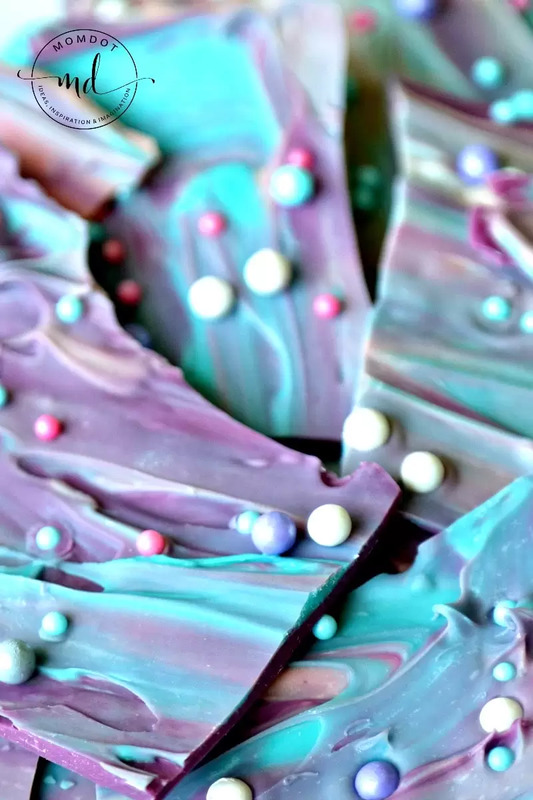 No matter whether you want to impart a scientific lesson with your kids on the stars, having a space themed birthday party, or are just looking to eat something tasty, this Galaxy Bark recipe is as easy as it is delicious. Update: Love Bark? 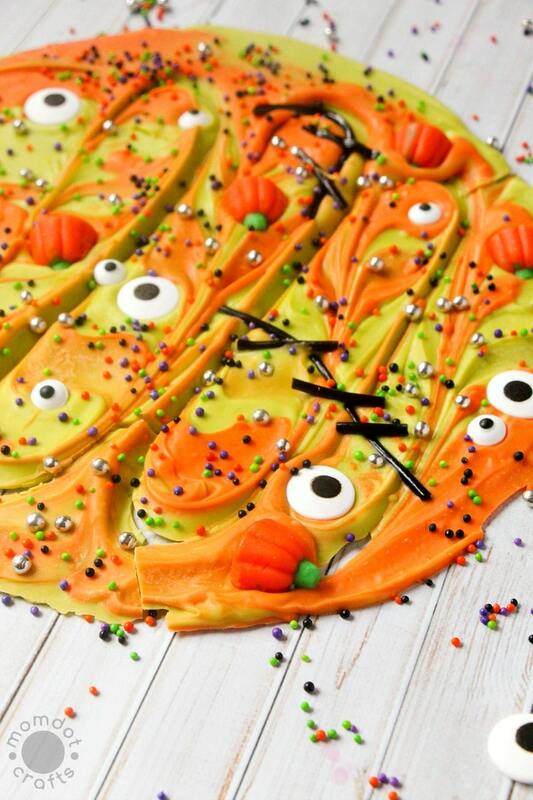 Try this Mermaid Bark or Easy Halloween Bark if you have left over chocolates! 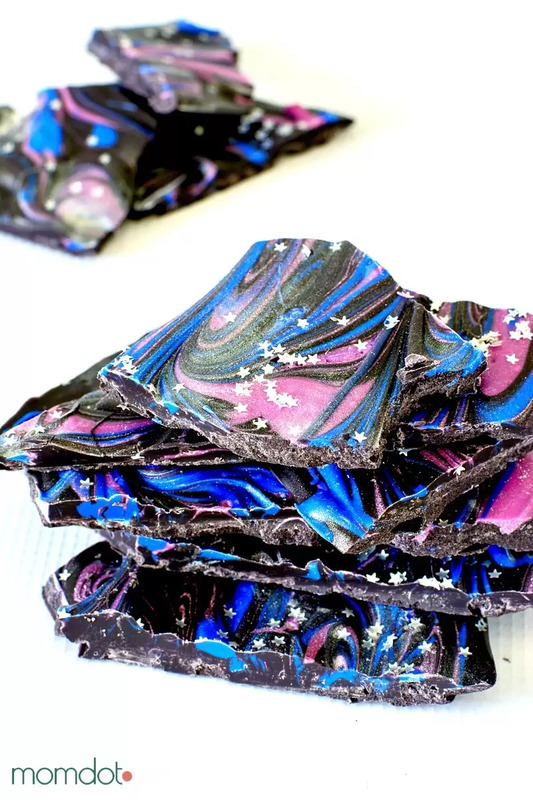 Pour black chocolate onto parchment paper – you could also use purple. On this tutorial the camera picked up more purple, but I assure you its black. It darkens up as it hardens to bark. Use a butter knife to “slice” through the melted chocolate. You want it to look like swirls. 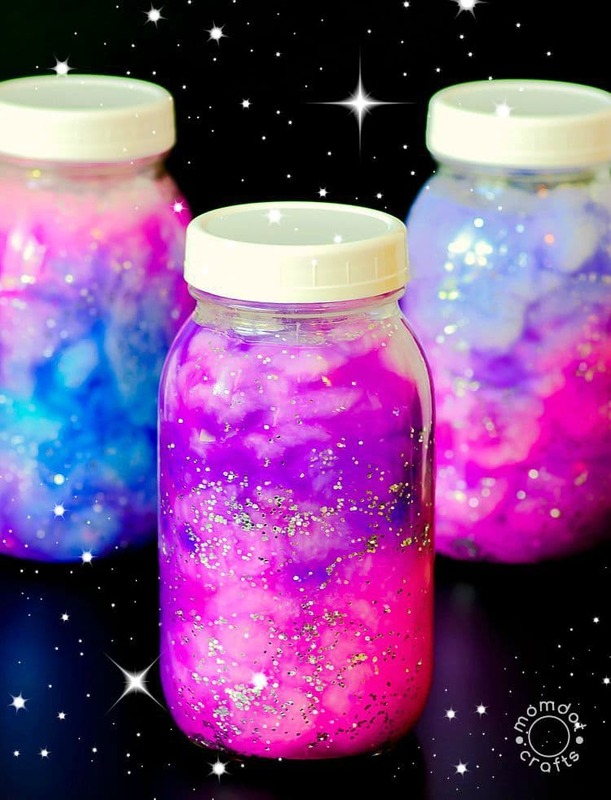 Sprinkle with glitter stars and refrigerate for 15-20 minutes to harden. These glitter stars are edible and really make it look like the sky! Once the bark is hard, dust with pearl dust using a clean paint brush. The pearl dust is a wonderful illusion that finishes up the bark. Also totally edible! Pour black chocolate onto parchment paper - you could also use purple. On this tutorial the camera picked up more purple, but I assure you its black. It darkens up as it hardens to bark. Use a butter knife to "slice" through the melted chocolate. You want it to look like swirls. Once the bark is hard, dust with pearl dust using a clean paint brush. The pearl dust is a wonderful illusion that finishes up the bark. Also totally ediable! Want more spaced themed ideas? 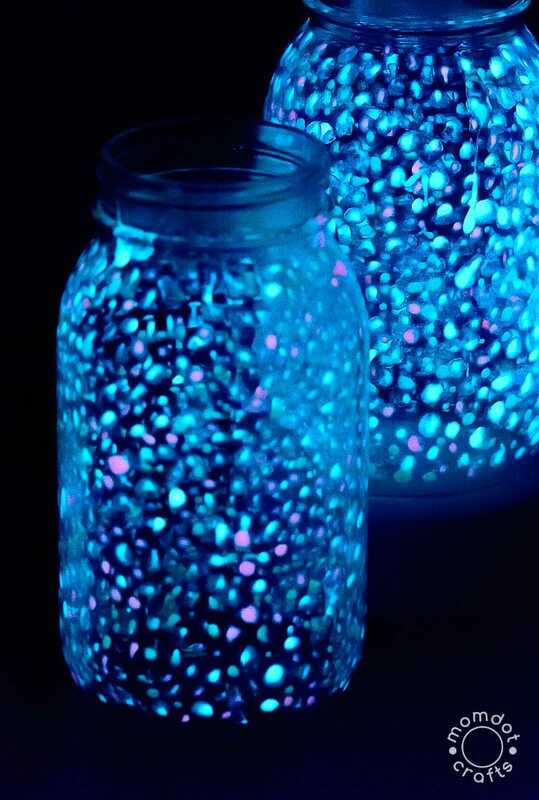 Try one of these fun ideas! « Trail Mix Travelers: Snack Hack!